Once again the year has flown and I'm kind of in denial about Christmas being so close, how about you? I've been meaning to draw more Christmas images for ages, so today I decided I'd better get totally involved in that project or the appropriate time will slip past me once again. Drawing is the best thing to alter a state of mind so hopefully it'll also inject some Christmas spirit into me. Since my imagination doesn't magically come up with ideas without some prompting, I first needed to find some reference material. Between you, me and the gatepost, I like to use old Christmas cards for inspiration. I'm very conscious about copyright infringement but I'm not selling my drawings so there's no harm done. 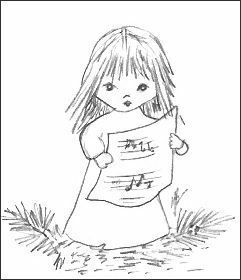 I never would have thought up such a cute image of a little girl holding a sheet of music. It was a pretty painted picture on a small gift card and all I had to do was translate it into a simple pencil drawing. Some artists can do a good representation purely from imagination but if that's not something that comes easily, do what I do and use whatever props you need. This practice produces results because our imaginations will develop over time. I notice already that I'm drawing more from imagination and it's exciting to watch that skill evolve. My latest Christmas drawings were inspired by a little 9 year old - my sweet granddaughter. She thinks I'm a great artist so that kind of encouragement is all I really need to keep chasing the dream. I hope you have someone who does that for you, too! You have to stay aware though, it doesn't matter who you talk to, don't take small talk for granted. Every single one of us has something to give and contribute to the world, you just have to be open to realizing it. I'm excited to announce the release of my 4th Kindle book called Drawing Tips for Beginners. Please click the link to see the first chapter for free. It's different from other art books and all tips have numerous examples to show you exactly how to achieve great images. If you have a yearning to sketch or know someone who loves to draw, the How To Sketch book is a popular gift. Another great idea is to buy the digital version of How To Sketch. Anyone who draws loves this type of present! Often there are times when a kneaded eraser won't completely remove a tiny area, even though it has been molded to a fine point and you carefully dab away while trying not to ruin the remainder of the drawing. It's really frustrating and obviously a solid eraser is the only answer to eliminating that smidgeon of graphite forever. Thing is, a good eraser is too big and it'd spoil too much of the drawing, right? Well, there are a couple of ways you can get to a small area. 1. Get a large pair of scissors and an eraser that has a rubbery consistency. Now cut it in half or thirds, it doesn't matter, so long as there's enough for you to get a good hold of it. Use the cut edge to get at wayward lines - you'll find it's perfect for the job. 2. Find a piece of scrap paper and cut a slit or hole to match the size of the area you want to erase. Place that paper on top of your drawing and line it up over the exact nuisance area. Once that's done, you can go ahead and give it a good scrub. Caution: You need to hold that paper very firmly to make sure it doesn't move and everything should be good. Find the best online drawing books that I have bought in the past that helped me learn, practice and improve. The best thing for you is that they all have a money-back guarantee because the books I like may not necessarily be the same ones you like. We're all different so don't worry if you don't take to them the way I did. If you have any drawing questions, please visit the frequently asked questions page to find some answers. Drawing is a very economical hobby - see the few basic supplies needed to get started. Are we connected on Facebook yet? Please join me, I'd love your company! , thanks so much for taking time out of your busy schedule to read this issue, I really appreciate your support.